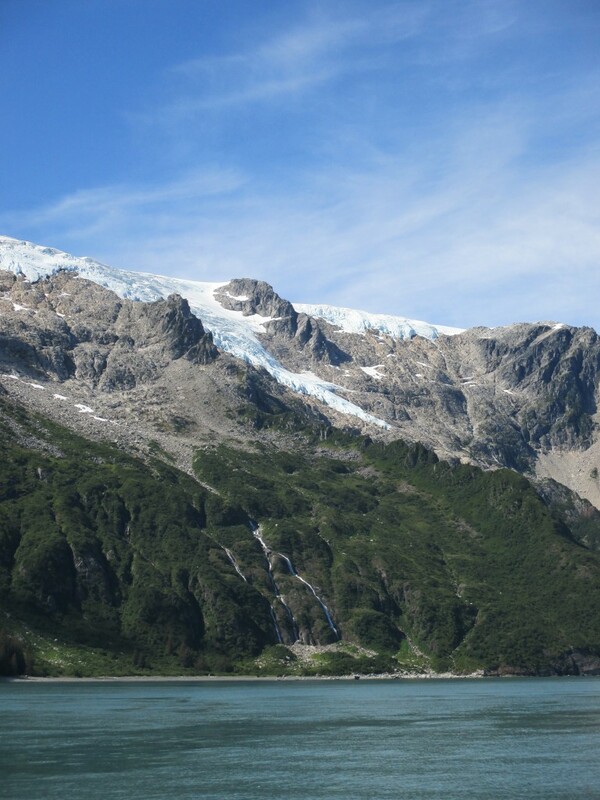 Kenai Fjords National Park (map / wiki) is essentially only accessible by boat or seaplane. Seclusion gives the area a serine and unspoiled quality, but it also means that in order to properly enjoy the park, you’re going to spend some money getting out there. In general, national parks in Alaska are on a “pay to play” policy which can be frustrating for someone trying to travel on a budget. I spent $160 on a 5.5 hour boat tour, but the fact is that you get to see wildlife and scenery that you would never be able to otherwise. Eight days ago (8/10/15) I ponied up, packed my lunch, and headed off with a boat full of fellow tourists. Ferry ride into Kenai Fjords National Park. 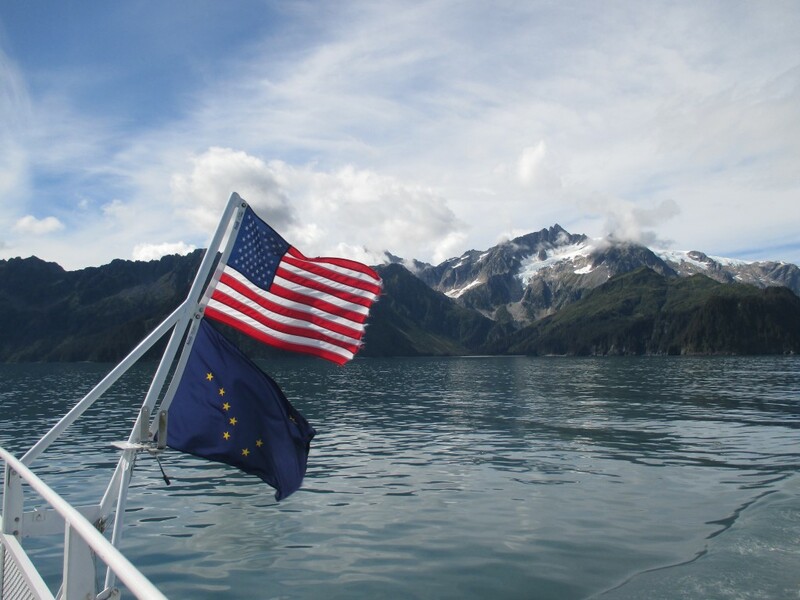 We left from the port in Seward and entered Aialik Bay to observe wildlife on the way to and from Holgate Glacier. 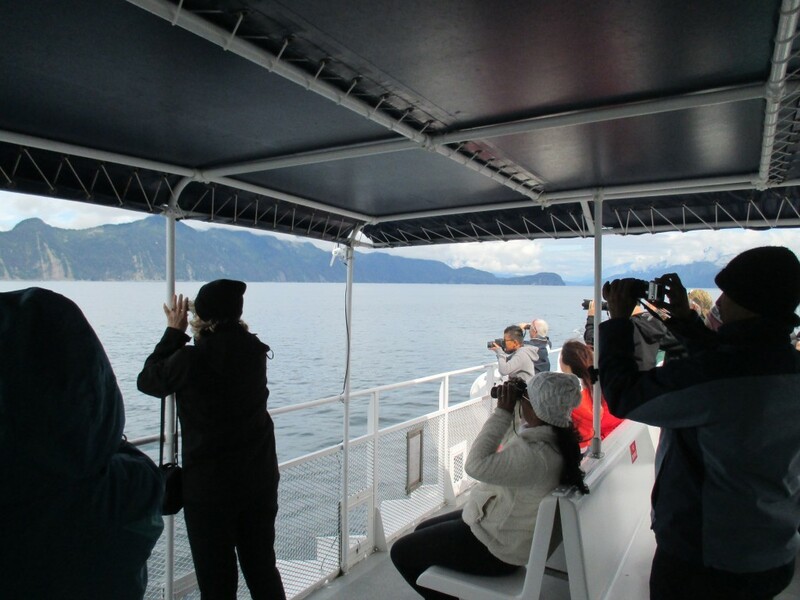 There were six or eight other tour boats taking similar trips, and they communicate with each other to locate marine wildlife. We stopped by a colony of horned puffin (wiki) nested on Rugged Island. At about the size of a large potato, Puffin are smaller than I expected, and they fly surprisingly well too (beforehand I wasn’t sure they flew at all). They spend their lives at sea and only visit land to nest. They lose their colorful beaks after their mating season revealing a drab grey beak underneath. We saw Dall’s Porpoise (wiki) which can be identified by the rooster-tail their dorsal fin splashes. We intercepted a few humpback whale. I wondered if any of them were related to the whales I saw in Hawaii in January. We motored by a pride of sea lions sunbathing on No Name Island, and our park ranger asked us to listen for any barking. Apparently, sea lion barking is a behavior unique to sea lions from Southern California, so they use it to track sea lion interaction in the Pacific. We came up on a raft of sea otters, but they woke up and quickly darted underwater. We didn’t see any seals or mountain goats, but fortunately we were able to catch up with the animal at the top of everyone’s list. On our way back from Holgate Glacier we intercepted a pod of three orcas. They looked sleek and rubbery, and they glided alongside us for three minutes or so. Their dorsal fin are huge, and it gives away their location before they fully come up to breathe. They didn’t do any tail flapping or free willy stunts, but I was happy to just watch them pace on. Their route was more deliberate than that of other whales, and they didn’t appear to be disturbed by our ship jogging next to them. They kept a steady speed and heading. If it were up to me, we would have explored the fjords more and focused on the humpback whales less. The cliffs and mountains were stunning. The Harding Ice Field extends beyond the peaks and at its edges the ice looks like generously slapped on cake frosting. It was tough to get a sense of the size until we got close enough to see the waterfalls in detail. There weren’t many free falling waterfalls. Instead ribbons of water emerged from the rock slides above the tree line and disappeared into the foliage near the shore. 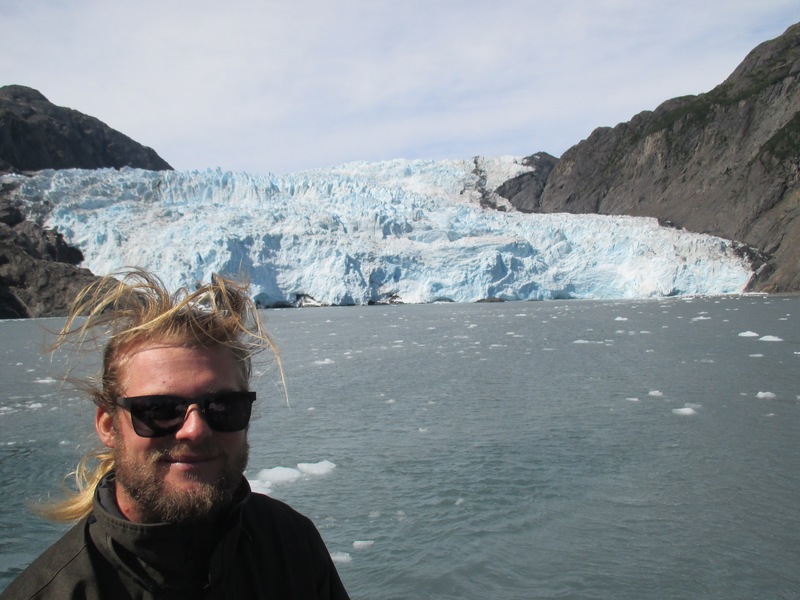 It was fun to see Holgate Glacier calve off a few times. The fracturing sound resembles thunder, and from the distance we were at, if you heard calving and turned to look for it, the show was already over.